News items in February & March 2018 relating to how the so-called “justice” system has disadvantaged Indigenous people in Canada for more than 154 years prompted your blogger, Paul C. Thistle, to create a new page on this web site. The Jury Colonialism 1885 – 2018 page provides access to an 8,200-word fully-documented paper “Indian-Hating” & “Massive Injustice of the Most Profound Kind”: Jury Colonialism Experienced by Indigenous People from Miserable Man (Kit-Ahwah-Ke-Ni), 1885 to Colton Boushie, 2018 (Thistle 2018). Historical context is absolutely crucial for these matters in my view. The above image shows Cree warrior Miserable Man surrendering, in Battleford, District of Saskatchewan, Canada in 1885 after the Resistance against Canadian government & white settler colonialism was quashed by Canada’s military & police forces. The photographer is James Peters (1853-1927). The image is found in the Frederic Hatheway Peters fonds / Library and Archives Canada / e011156623_s3-v8 ; C-004864 MIKAN no. 3406940 (2) at http://data2.archives.ca/ap/c/c004864.jpg [those pictured have not been named individually]. The subject that stirred me to write an historical analysis on the Thistle (2018) Jury Colonialism 1885 – 2018 page was the news on 9 February 2018 that the jury in a second-degree murder trial in Battleford, Saskatchewan, Canada of a white settler accused in the shooting death of a young Indigenous man returned a not guilty verdict. See the Jury Colonialism 1885 – 2018 page above (Thistle 2018). I have no problem whatsoever with the ideals of presumed innocence or the rule of reasonable doubt in the acquittal at trial. However, press & other witnesses to the pre-trial jury selection process reported that potential jurors who appeared “Indian-looking” were dismissed by the defence under the practice of “stand-asides” or “peremptory challenges.” In Canadian courts—as opposed those in Britain for example—such dismissals occur without the need to provide any reason for excusing a potential juror. As demonstrated on the Jury Colonialism 1885 – 2018 page above, this is a long-standing injustice imposed on Indigenous people in Canada that can—& does—license racialisation of jury makeups. The absence of Indigenous members on the 2018 jury in question above struck a chord with me because of my earlier research on the trials of First Nations participants in the Riel Resistance of 1885. Subsequently, I also learned of at least 3 separate, authoritative reviews (2 judicial) that had—beginning 27 years ago—recommended specifically that the Canadian government eliminate the peremptory challenge process in jury selection. This is to protect Indigenous people from Crown attorneys and/or defence lawyers barring them as candidates from juries on concealed racism grounds. Suffice it here to say, given the law of the day & the demonstrable injustices that occurred in the trials of Indigenous defendants in 1885—to say nothing about the prejudiced attitudes of Canadian politicians & white settlers in the District of Saskatchewan in 1885 who served on the juries—it remains a shameful disgrace on the Canadian justice system that Indigenous individuals are so easily excluded from serving on juries right up to the present day (10 April 2018). 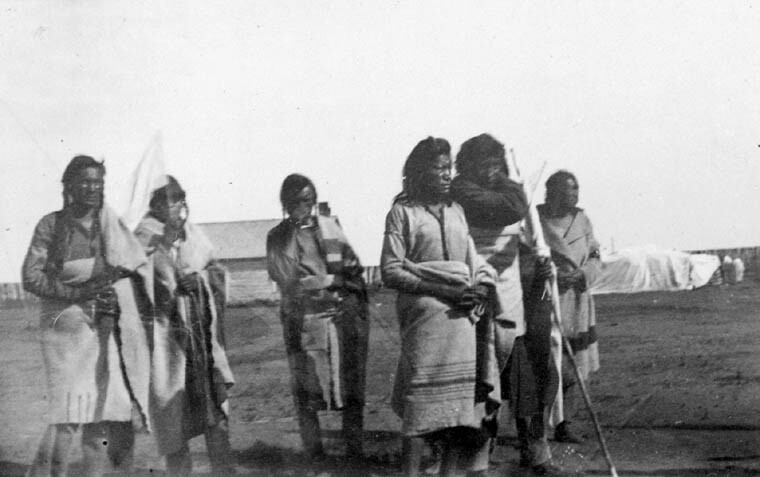 All 8 First Nations defendants brought before the court on charges of murder in 1885 were tried without legal counsel, convicted by a jury made up exclusively of white settlers, some convicted summarily without the giving of evidence or any defence, & sentenced by a magistrate who—before the trials—had publicly expressed his opinion on the guilt of any Indigenous person brought before him & openly spoke his intent to order executions (Thistle 2018). This travesty of justice resulted in the largest mass hanging in Canadian history at Battleford in the District of Saskatchewan on 27 November 1885. Notably, the acquittal in the 2018 second-degree murder trial also occurred in present-day Battleford, Saskatchewan, Canada. Miserable Man (Kit-Ahwah-Ke-Ni) named in the title of my Jury Colonialism 1885 – 2015 page article (Thistle 2018) was one of the 8 Indigenous men hung publicly to demonstrate the power of the Canadian colonialist state to the Indigenous people of the region who were brought in to view the executions—including all of the students of the local Battleford Residential School. The “Indian-hating” term leading the title of my article follows from the applicability of the extensive classic work Facing West: The Metaphysics of Indian-Hating and Empire-Building by Richard Drinnon (1980). Drinnon conclusively demonstrates the racist idea of Indigenous ‘savagery’ held by imperialists functions as part & parcel of colonialism against Indigenous peoples. Two Breaking News reports, the last of which tells of the tabling of a new bill in the Canadian Parliament that purportedly will amend the jury selection process to eliminate peremptory challenges of potential Indigenous jurors. The fully-documented article ‘“Indian-Hating” & “Massive Injustice of the Most Profound Kind”: Jury Colonialism Experienced by Indigenous People from Miserable Man (Kit-Ahwah-Ke-Ni), 1885 to Colton Boushie, 2018’ is available via the link in the Thistle (2018) reference below or the Jury Colonialism 1885 – 2018 last page menu item at the top of this post. Drinnon, Richard. 1980. Facing West: The Metaphysics of Indian-Hating and Empire Building. Minneapolis: University of Minnesota Press. Thistle, Paul C. 2018. ‘“Indian-Hating” & “Massive Injustice of the Most Profound Kind”: Jury Colonialism Experienced by Indigenous People from Miserable Man (Kit-Ahwah-Ke-Ni), 1885 to Colton Boushie, 2018.’ Saskatchewan River Region Indian-European Trade Relations web site Jury Colonialism 1885 -2018 page at https://indianeuropeantraderelations.wordpress.com/indian-european-trade-relations-in-the-lower-saskatchewan-river-region-to-1840-thistle-1986/jury-colonialism-1885-2018/ or in the last item in the menu at the top of this blog page. This entry was posted in Indigenous history and tagged "Indian-hating" in Canada, #decolonize, #resist150, 1885 Resistance trials, Battleford 8, Canada 150+, colonialism in Canada, Colton Boushie wrongful death, Cree - History, Gerald Stanley trial jury selection, Indigenous participation in the 1885 Resistance in Saskatchewan, Indigenous representation on juries, jury colonialism, largest mass hanging in Canada, Paul C. Thistle, peremptory challenges of potential Indigenous jurors, Saskatchewan River Valley - History, trials of Indigenous people on April 10, 2018 by Paul C. Thistle.